In 2009, Leanne Pressly was working at Interweave Press consulting clients on print advertising when she realized they needed so much more. She launched The Wool Wide Web with services specific to knitting companies and grew the company to 30+ retainer clients in just 3 years. 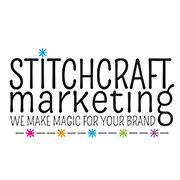 The newly rebranded Stitchcraft Marketing emerged in 2013 to encompass all our other crafting passions and provide the same results for companies in the yarn, fabric, beading, paper, and crafting sectors. Check out our portfolio or review all the services we offer!